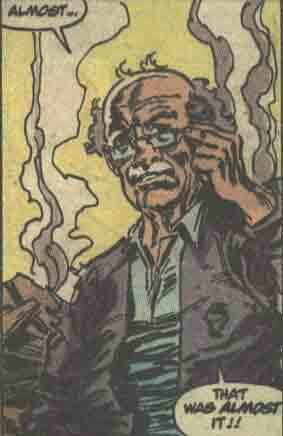 Powers/Abilities: Professor Harker was a brilliant scientist whose crowning achievement was the Universal Compressor. History: (Avengers I#306) - Professor Harker checked on his Universal Compressor, having briefly forgotten about the inverter, and concerned that it might overheat. (Avengers I#308) - Professor Harker tested the Universal Compressor, resulting in an explosion which destroyed his house. "Almost...That was almost it!!" he remarked. (Avengers I#309) - Harker brought the designs for the Compressor to Polydyne, and fascinated the people there with his work. They offered to finance his project. (Avengers I#311) - Professor Harker was monitored from space by Nebula, who had determined that he was the one to assist her in her plan to obtain the power of the Infinity Union. (Avengers I#312) - Professor Harker returned to his apartment one day after fetching groceries to discover Nebula waiting for him. Nebula offered to assist him with his Compressor. (Avengers I#314) - Professor Harker activated his compressor at Polydyne, and achieved .0000000000000000001% efficiency, sufficient enough to cause the universe to flash out of existence for a brief moment. Nebula then had Harker activate it again, and this time sustained its effect. (Avengers I#315) - Nebula was furious to discover that the universe was now gone, and asked Harker to explain what had happened. Harker revealed that the compressor had caused a "Genesis Pulse," destroying the universe in order to create a new one. When the Avengers arrived at Polydyne, having also survived the universe's destruction, Harker attempted to aid them by telling them how to deactivate the compressor, but Nebula disintegrated him with a laser blast to shut him up. Comments: Created by John Byrne, Paul Ryan and Tom Palmer. His full name was revealed in Nebula's profile in OHotMU A-Z Hardcover#8.